Mini Exchange founder and CEO, Sarah Appleton. 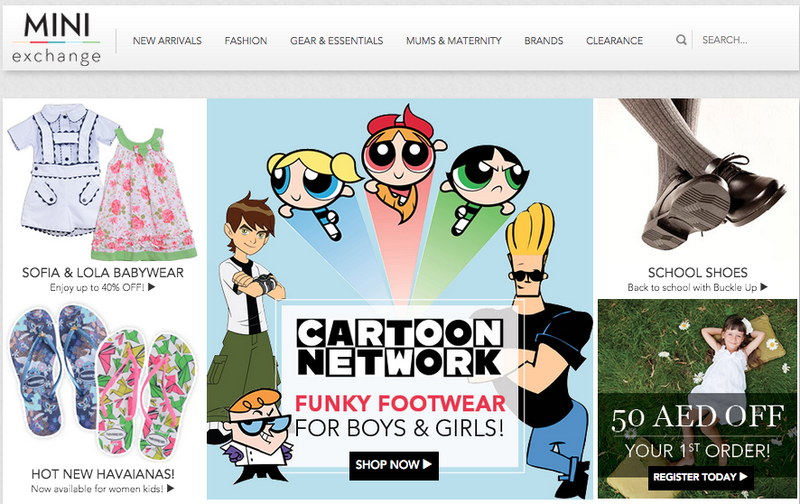 Mini Exchange is the region’s first online marketplace for kids’ fashion. Think a high-end eBay, but with none of the hassle crossed with an online outlet mall, and you have Mini Exchange. Mini Exchange is something that’s never been done before in the region; we’ve built an online marketplace for parents to buy and sell new and like-new kids’ clothing, accessories, fancy dress and school uniform, and we’ve also developed a site for brands and retailers to sell their end-of-season items. It’s simple: thousands of items, all at a discount and delivered to the doors of parents with just the click of a button. So how did it all begin? I took the plunge and left the corporate world last year to focus on founding Mini Exchange and then launched the site in January of this year, which feels like a lifetime ago already! I used to work in finance and was always working for other people, advising inspiring entrepreneurs on how to grow and sell their companies, and secretly I was always envious when they left the room. I wanted to be on the other side of that table. I’ve also always loved the consignment world and got the bug for it during my university years. Seeing a similar concept to Mini Exchange work in other parts of the world coupled with the fact that there is nothing like it in the region really gave me the confidence to jump ship and try and make a success of something I’d always been very passionate about. Leaving the security of a corporate job with steady hours and a comfortable, regular income was very hard. Now I can look back and be glad that I did it, but at the time I had no idea how it would work out or what might happen. I hadn’t had any experience of setting up my own business and definitely no experience of setting up my own business in the Middle East. The process was lots of hard work, not much sleep, lots of highs and lots of lows. I think on more than one occasion I called my family back in the UK and said, “Right, that’s it, Mini Exchange isn’t going to happen.” Perseverance is definitely key. One of the biggest challenges of setting up an e-commerce business in the Middle East is that there are still lots of people here that are apprehensive about ordering online. When and where will the item be delivered? Will my credit card details be secure online? These are the common questions that we get from new users and although we believe that the e-commerce market is set to boom out here, it does take time to build user confidence in these areas. Because e-commerce is still in the fledgling stage, a lot of the support services are also still developing. One example? Setting up a “payment gateway” so that users can safely input credit card details is very arduous and expensive. I know that in Europe procedures like that would have been a lot easier. I launched Mini Exchange with my own capital and some from one other investor. The upside of doing this is total control. We have had interest from external investors already, but decided to invest further ourselves– we think the initial capital in the business is allowing us to fully prove out the demand side of the business, which will put us in a better position for our first external round of funding. The response to the site really has been amazing. Parents love how easy the site makes shopping online and they value the how easy the site makes selling items that their little ones no longer fit. In terms of progress to date, we’ve signed over 20 partnerships with global and local brands and retailers and already have over 1,000 items listed on the site from parents. There are greater than 4,000 items listed on the site from the brands or retailers themselves, which is really exciting. We foresee those numbers doubling over the next six months- parents can then select from an even wider range of kid’s fashion on Mini Exchange. The site currently has everything from Gap pajamas to little Dior dresses, and all of the items are listed at a discount so there’s something for everyone. When the business was just three months old we won the ArabNet Beirut StartUp Demo Competition, and then went on to be a finalist in the Seedstars World competition. We have also just been nominated for three of the categories in the Gulf Capital SME Awards: Start Up of the Year, Online Business of the Year, and Innovation of the Year. To hear that was pretty amazing, and when I see who we are up against it’s very humbling. I’m very proud of my team and all the users that support us- we couldn’t have got this far without them. Although the site is technically already global with parents being able to sell and shop from anywhere in the world, our marketing efforts are currently focused on the UAE. The near term plan is therefore to spread the word to more and more people in the UAE, and then to push the site into a number of the neighboring GCC markets. It’s an exhilarating time. We think that we really are on the road to creating the online marketplace for children’s fashion in the region– the place where all parents come to shop for their little ones. We have big plans for the site across the Middle East, not just in the UAE, and I’m really looking forward to the next phase of Mini Exchange.